Attendants: Select number of hours you need supervision. NJ Public Information and reporting package: We are fully compliant with NJ laws for public rentals of inflatable amusement rides. We are NJ State permitted and inspected with required permits attached to all of our units. We provide the following items in this package: (1.) 28” bright, colorful safety 'traffic cones' with (2.) colorful safety ropes to direct the line of children, (3.) public information signs as required by NJ law and (4.) signs to separate the children by age/size. (5.) 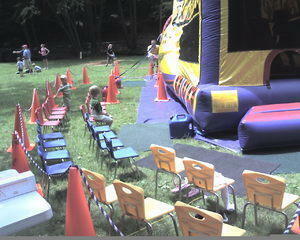 Obstacle course rentals get two sets of color coded chairs to make two rows for children to prepare to race through the obstacle. Jump house rentals get color coded children’s chairs (6/8 of each color) for small, medium and large age/size groups, that the children sit on to remove and put on their shoes as well as listen to the safety rules while they wait their turn. (6.) NJ required 'Information and Reporting' table (with an EZ Up shade tent for outdoor locations if available stock permits.) and ride manual. (7) We will also provide a few adult chairs for tired spectators to rest while viewing the children. The total price for this package for the duration of your event is $175.00. Our owner has an official commission on the NJ State Carnival Amusement Ride Advisory Board so you can rest easy that we know our stuff, we will do it right, and all we do will reflect positively on you!